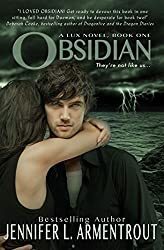 Obsidian is book one in the Lux series by Jennifer L Armentrout following Katy and Daemon on their adventures. Katy moves from sunny Florida to tiny town West Virginia, much to her dismay. Her next door neighbors are beautiful twins Dee and Daemon Black. Although Dee is kind, Daemon is an arrogant jerk. Katy tries to make friends with Dee, but it’s not an easy road. Of course, what she doesn’t know, is there’s a good reason for Daemon’s warnings to her even to his sister’s frustration. Getting close to the Black twins opens up a world Katy didn’t know existed. They’re aliens. They’re Luxen. And Katy’s world just got turned upside down. Katy is a young girl thrown into a bad situation and she must learn to deal. Dee is the rebellious alien girl just wanting to make friends with humans. And Daemon is the overprotective brother who feels the fate of his people rests in his hands. The interaction between Katy and Daemon is refreshing and witty, which makes the two the perfect pair.